The IAA, together with the Certified Financial Planner Board of Standards, Inc., the Financial Planning Association, the National Association of Personal Financial Advisors, and TD Ameritrade Institutional, commissioned the BCG study to determine the costs of the options outlined in the SEC’s Dodd-Frank Act Section 914 report on increasing the frequency of investment adviser examinations. The BCG report analyzes the costs of: 1) increasing the level of SEC examinations; 2) set-up and operation of an investment adviser SRO by the Financial Industry Regulatory Authority (FINRA); and 3) set-up and operation of an entirely new SRO for advisers. 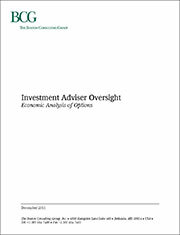 BCG’s economic analysis was based on the assumption that advisers would be examined by the SEC or SRO on average once every four years. If you have any questions about the above, please contact IAA Vice President for Government Relations Neil Simon at neil.simon@investmentadviser.org. 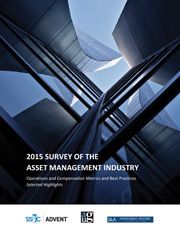 The Asset Management Operations and Compensation Survey is conducted by the Advent Users Group (AUG), an independent non-profit organization comprised of investment professionals. The IAA co-sponsors the survey, viewing it as a potential tool that IAA members could use to evaluate firm operational and compensation practices. The survey and its results focus on firm attributes, technology and operations, and human capital. Survey highlights are available below; full results are provided for survey participants. For more information, please contact IAA VP, Communications and Marketing, Herb Perone, at (202) 293-4222 or herb.perone@investmentadviser.org. At the end of 2005 and 2010, the Investment Adviser Association conducted a membership satisfaction survey. IAA members may download the report for a full description of the Survey's methodology, findings, and data.